If you want a winner in the Cain-Gingrich Lincoln style debate, it would be Newt Gingrich; simply because this format fits the one candidate who has the broadest knowledge of government and policy. This is not to say that Herman Cain did not have his moment and let’s be blunt; Cain did not have to win in the traditional sense for all he needed was to show that he could debate issues beyond a thirty second sound bite. 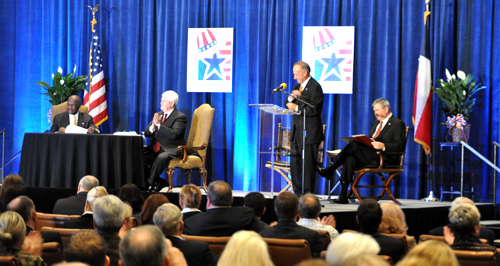 The debate focused on the entitlements featuring Medicare, Social Security and Medicaid with each participant allowed three minutes, interrupted by occasional questions from the moderators and each other. Cain showed knowledge of heath care saving accounts plus discussion about tort reforms (which a certain Texas Governor signed, least I forget Perry own role in health care reform). When debating or discussing with Gingrich, you’ll get treated to a history lesson. Gingrich gave a historical perspective on our present health care crisis starting with 1943, and then he launched into an attack on the CBO and how the CBO bean counters often get economic calculations wrong including health care spending estimates. There were times that Cain either deferred to Gingrich or simply allowed him to go first as one pundit tweeted, "Leading from behind, Cain Style." If Cain's performance was uneven, he did manage to ingrate himself to the audience and showed that he has done his homework on these issues. His answer to social security future featured a nice dialogue on the Chile experiment with a privatization program. The problem that Cain had was sitting next to Gingrich, whose knowledge interspersed with his occasional quip makes it a difficult comparative for any debater with a format that allows Gingrich to expand upon his thesis beyond the thirty second sound bite. From a debate point of view, the two disagree very little as they both called for repealing Obamacare, blocking grant Medicaid to the states and taking a more private market approach to health care reform. Gingrich summed up the 2012 election noting, "This will be a big debate with the left, which has this view of everyone as weak and stupid." Though technically, this was less of a debate and more of a discussion. Both candidates helped themselves in their own way. Gingrich showed that he has the mastery of the issues and Obama better hope he doesn’t debate Gingrich for Gingrich would expose Obama's shallow policy knowledge. As for Cain, he is a good closer and there is a connection to the audience that he maintains. His question on “What you would like to do as Vice-President?” had both Gingrich and the crowd rocking. Cain showed that while he is not in Gingrich's league when it comes to being a policy wonk, he did show substance, which is all he needed. This was the liberty debate in which both talked about how to restrain government. The Cain-Gingrich program was not the usual austerity program; cut this and cut that, but instead reforming entitlements by giving choices to consumers. It was an agenda of hope and growth, contrast that to what is happening in Europe, where all the elites offer the common folks nothing but high taxes, less benefits, and no hope for the future. It is a future where solutions are commanded from above and no choices are given to the voters. Obama’s own dream world is collapsing in Europe as the Euro zone is close to imploding and Obama’s Occupy allies are rioting in the streets and the economy is stagnating. Gingrich and Cain are the happy warriors who view America's best days are still ahead, and they are not interested in managing America’s decline. That is for the other Party.